Both candidates seek to sway a narrow swath of undecided voters as national polls tighten. WASHINGTON — As the White House race shows signs of tightening nationally, President Obama’s campaign is banking on a massive get-out-the-vote operation and state-by-state shades of economic improvement to maintain its apparent polling edge in battlegrounds from Ohio to Virginia. Republican Mitt Romney, re-energized by last week’s debate, is flashing new confidence on the campaign trail and pressing toward the political center on both foreign and domestic issues. But aides have outlined no clear path to winning the 270 Electoral College votes required to gain the White House. “Things are going pretty good,” the usually cautious Romney said Monday. Among Democrats, the swagger of the previous few weeks has all but vanished since the debate. “Ultimately this is a tight race, and it’s going to remain a tight race until the end,” said Bill Burton, who runs Priorities USA Action, a pro-Obama “super” political action committee. Indeed, one month from Election Day, polls show a close race. And with millions of Americans already voting and the potential for game-changing moments diminishing, the candidates have little room for error as they seek to sway a narrow swath of undecided voters. Obama aides acknowledge Romney’s strong turn on the debate stage helped him shift gears from a rocky September. But they also argue that Romney’s momentum was arrested somewhat by a Friday jobs report showing the unemployment rate declined to 7.8 percent, the lowest level of Obama’s presidency. They say the president was thrown during the debate by what they call Romney’s willingness to abandon his previous positions, including his $5 trillion tax cut proposal. In the next debate — and in television advertisements before then — the Democrat and his aides are expected to accuse Romney of lying about his own plans. Romney’s team, meanwhile, is tempering expectations that tightening national polls will translate into success on the ground in the key states most likely to decide the race. Things may be moving in the right direction, they say, but significant work remains. Still, they’re seeking to paint Obama’s campaign as desperate. “It seems pretty clear that their new strategy is basically just call us liars, to descend down into a mud pit and hopefully, with enough mudslinging back and forth and distortion, people will get demoralized and they can win by default,” said Romney running mate Paul Ryan. Both Democrats and Republicans say internal campaign surveys following last week’s debate show Romney has cut into the lead Obama had built up in many key battleground states. But they say Obama still has an advantage in most of the nine or so critical states, including Ohio and Virginia. A lack of independent polling makes it difficult to know whether that’s true. 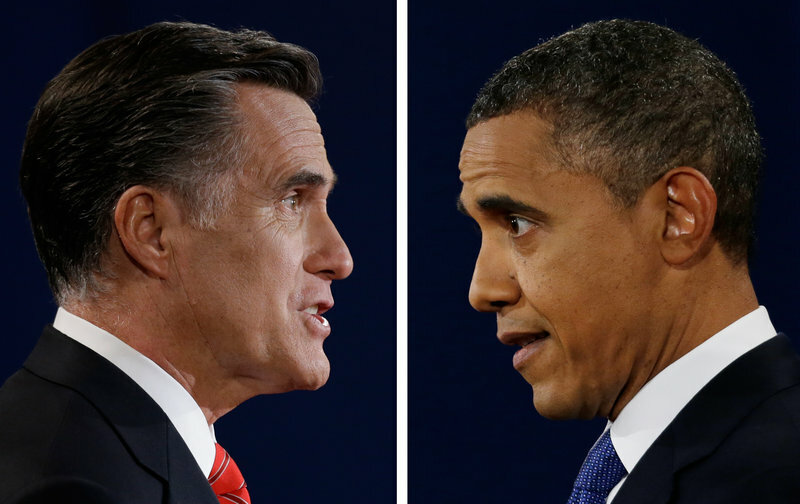 Romney pulled ahead of Obama, 49 to 45 percent nationally, among likely voters according to a Pew Research Center poll conducted after the debate. At the same time, he is moving away from some of the more conservative positions he pressed during the GOP primary. The shift is aimed at appealing to the independents and disaffected members of both parties who could swing the race. He is to deliver at least two more policy speeches in the coming weeks focused on job growth and debt and spending. As Obama’s aides worked to poke holes in Romney’s foreign policy address, Obama declared a national monument at the Keene, Calif., home of Latino labor leader Cesar Chavez, the United Farmworkers Union founder who died in 1993. Sure to appeal to some Hispanic voters in swing states, Obama’s move came at the start of a day in which he also was raising political cash at events in San Francisco, as his campaign closed in on $1 billion in donations. Democrats said the $181 million they raised in September would allow Obama to keep advertising heavily on television in all battleground states and fully fund major registration and early voting efforts in the campaign’s crucial final weeks. The president has more get-out-the-vote offices than Romney in every competitive state; some offices never closed after the 2008 campaign. Democrats say that network helped them register more than 130,000 new voters — most in battleground states — in the week before the debate. There are more registered Democrats than Republicans in nearly every competitive state with party registration, including Florida and Nevada. Romney’s team is working hard to chip away at that margin. In the season of debates, next up is the only match-up between Vice President Joe Biden and Ryan. A strong performance by Biden, a former senator who essentially made a career out of debating colleagues, could quell nervousness among some Democrats, though neither party expects undecided voters to be swayed by the face-off. Ryan’s challenge is to overcome his lack foreign policy expertise and national debate experience. Biden was preparing in his hometown of Wilmington, Del., where he has held two mock debates with Rep. Chris Van Hollen, D-Md., who is playing the role of Ryan. Obama and Romney will face off again on Oct. 16 in Hempstead, N.Y.